I’m a city girl. Always have been. Always will be. I was born in a big city, raised in a big city, and lived 63 years of my life in that same big city. But the last couple of years have introduced me to a life that is a total contrast – 360 degrees – from what I’m used to. Two years ago, everything changed and my life took a turn that lead me to a totally different lifestyle. It’s interesting how some things can be so different, yet ultimately they are the same. For instance, when I lived in the big city, traffic had me creeping along at 10 miles an hour until I was ready to scream and abandon my car. Now, with no traffic, I still find myself creeping along at no more than 10 miles an hour because I’m stuck behind a huge piece of farm equipment and I can’t pass it. I see all that open road ahead and I can’t get to it. Again – wanting to scream and abandon my car. In the big city, I couldn’t sleep at night because of the constant sirens and car horns beeping. Now, in my quiet community, the frogs, crickets and owls keep me awake. You may think that the later is more desirable, but if you can’t sleep, no matter what the reason is, it drives you crazy!!! So what has all this contrast taught me? One huge lesson – that there is a side of me that I didn’t even know existed. This different way of life brings me new experiences every day, helps me grow, and become a more interesting, fulfilled person. What contrast do you have in your life? If you live in the city, do you take time to venture out into nature and enjoy something different? If you live in a smaller town, what about stepping out of your comfort zone and experiencing the excitement that a city can offer? Try it, and you will find things about yourself that you didn’t even know existed. 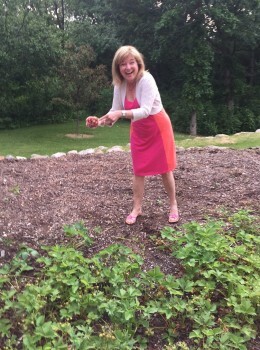 To prove it, here’s a photo of me, the city girl, actually picking strawberries that were grown in my own back yard. They are delicious! Yes, this is me, enjoying the contrast in my life. thing is to find the good, and find the fun, no matter where you call home.